There must be hundreds of thousands of zebra crossings in the UK, but this is the one that people from all over the world want to see for themselves. You can even watch people walk across the crossing live at this site. Geography Cat sent his stunt double Mike to find out more. The location is Abbey Road, St Johns Wood, City of Westminster, London. There might be some young people who don’t recognise the image in the card above; the iconic picture was taken by photographer Iain MacMillian, a friend of John Lennon and Yoko Ono. The Beatles used this shot for the cover of their album “Abbey Road”. You can read more details about the photo shoot here. This fine looking Georgian townhouse is just the frontage of a much larger construction to the rear housing the world’s first ever purpose-built recording studio. It opened in 1931 with Edward Elgar conducting the London Symphony Orchestra in a recording of his music. The photo above shows Studio One, used for scoring movie soundtracks such as the Harry Potter, Lord of the Rings and Star Wars films, amongst many others. Music for gaming is just as likely to be recorded here now, from the background tracks of Halo, to The Sims, or many other popular games that Geography Cat plays whenever he can. The studios and the technology here at Abbey Road are like every other human geographical location on the globe – they are only as good as the people who build them, those who use them, and those few who have the imagination, skill and creativity to make something amazing. The success of The Beatles has been heightened by the opportunities that the staff, engineers and producers at these studios made possible. Nearly all of The Beatles’ output was recorded here and the sustained creative innovations in music recording helped to give some of the best loved music to people all over the world. 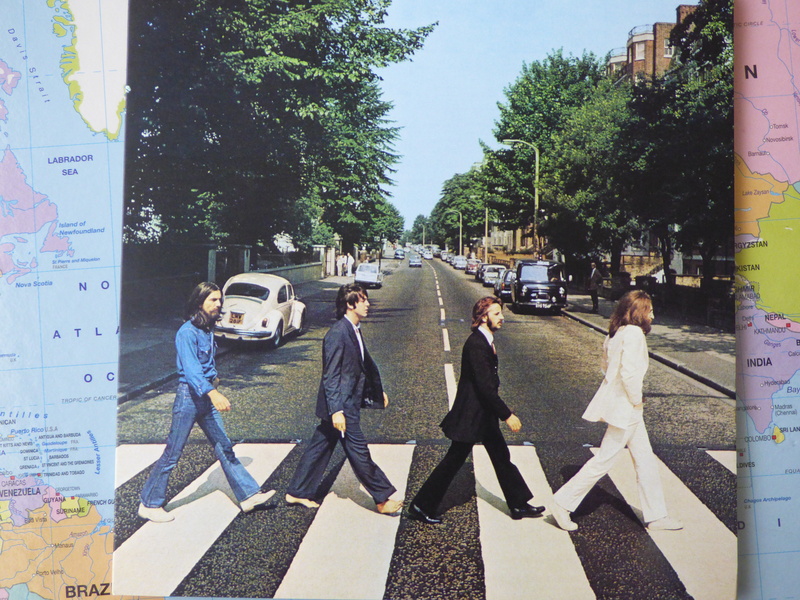 The album “Abbey Road” was named after the street itself, and in 1970 the EMI Recording Studio changed its name to Abbey Road Studios. The album was The Beatles’ last, but the studios have continued to be the home of innovation in music recording. Even if you never listen to any recordings made at these studios, Geography Cat guarantees that your listening pleasure has been enhanced beyond words by the work begun here back in 1931, when electronics engineer, Alan Blumlein, invented and developed stereophonic sound (stereo), used in television, radio, film and music ever since. And so a place of technological and musical creativity and innovation has become a honey-pot site for tourists. Or has it? Mike saw a lot more people taking their photographs on the Abbey Road Crossing than he saw going into the studios. The studios are a working building, not a museum; maybe the crossing, and signing their name on the wall, is as close as most people can get. If you want to find out more you should take a look here: Inside Abbey Road. It’s an incredible website and well worth a look! What is the sphere of influence of Abbey Road Studios?